Welcome to this 2nd e-LIVES newsletter. 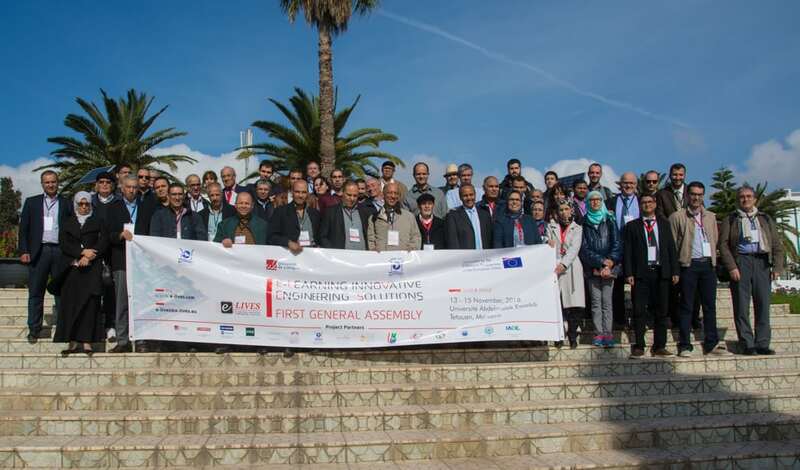 One year after the beginning of the project, the 1st General Assembly meeting joined in Tétouan, Morocco, under the auspices of the Abdelmalek Essaadi University, all project partners. During the meeting, it was revised the work done so far in each one of the six work packages that comprise the project. The evaluation was extremely positive with all tasks running on schedule. The consortium also discussed and approved the quality, sustainability, communication and dissemination plans of the project. Accordingly, it is expected the project will have the first draft of the e-Engineering Good Practice Guide available for download on the e-LIVES website by the beginning of the New Year. This document will be the most important to be developed by the project partners, as it is expected it will serve as a guide for the development of new e-Engineering courses worldwide. To disseminate the concept of e-Engineering and the work done inside the project, a Special Interest Group (SIG) was created within the International Association of Online Engineering (IAOE), the e-Engineering Alliance Special Interest Group. Regarding the quality assessment tools, developed to enable the quality assessment of e-Engineering courses, the questionnaires addressed to students and teachers are also ready to be revised. These questionnaires focus the functional, pedagogical and didactic aspects of an e-Engineering course and serve to evaluate the perception stakeholders have of the course and the corrective measures that may eventually be necessary to introduce to improve their level of satisfaction. After revision, all documents produced by the e-LIVES consortium will be made available to download at the e-LIVES website. A discussion forum will be open to receive the valuable contributions of all interested in the subject and in the establishment of e-Engineering courses in their Institutions. The 1st General Assembly of the e-LIVES project took place in the beautiful city of Tétouan between the 13th and the 15th of November. During the three days of the meeting, partners assessed the current development of the project activities and set the goals for the next twelve months, according to the initial project proposal. The 2nd General Assembly of the project will take place in Madrid, Spain, between the 5th and the 7th of November, 2019. In the framework of the e-LIVES project, we are conducting a survey on the compensation arrangements for teachers engaged in nationally accredited distance learning courses. If you are responsible (University President, Dean, Head of Teaching Department, Pedagogical Responsible, etc.) within a higher education institution that offers this type of training and/or you are teaching, we kindly ask you to answer a short survey. The long-lasting purpose of the e-Engineering Alliance is to generate in higher education institutions a more committed and professional environment ready to introduce new forms of flexible learning into daily training activities and to create and manage accredited e-Engineering courses. If you want to know more about the concept and to be involved in the e-Engineering Alliance activities, go to the e-Engineering Alliance webpage, and see how to become a member. It is completely free. E-LIVES will be presented at the Algeria ERASMUS+ technical assistance mission – Développement des méthodes d’enseignement en utilisant les nouvelles Technologies de l’Information et de la Communication, to be held at Béjaïa University, the 28th and 29th of November, 2018. A one-day workshop will be offered to the participants of the 16th International Conference on Remote Engineering and Virtual Instrumentation (REV2019), to take place in Bengaluru, India, between the 3rd and the 6th of February, 2019. The workshop aims to train attendants in the pedagogical and technical design of a remote laboratory for electronics. All REV conference participants will have free access to the workshop. The workshop schedule will soon be available at the REV conference webpage. The e-LIVES will organize a Special Session at the 16th International Conference on Remote Engineering and Virtual Instrumentation (REV2019) to promote the e-Engineering Alliance Special Interest Group. The aim of the Special Session will be to disseminate the e-Engineering concept, demonstrating its importance for the development of higher education and lifelong learning training, and to engage new members committed to this objective. The Special Session chairs will be Manuel Gericota and Paulo Ferreira, from the Polytechnic of Porto, and Abdelhalim Benachenhou, from the Abdelhamid Ibn Badis University of Mostaganem. All REV conference participants will have free access to this Special Session. The session schedule will soon be available at the REV conference webpage.